冯传宴, 完颜笑如, 陈浩, 等. 基于多资源负荷理论的情境意识模型与应用[J]. 北京航空航天大学学报, 2018, 44(7): 1438-1446. FENG C Y, WANYAN X R, CHEN H, et al. Situation awareness model based on multi-resource load theory and its application[J]. Journal of Beijing University of Aeronautics and Astronsutics, 2018, 44(7): 1438-1446. Abstract: Based on the attention-situation awareness (A-SA) model and the attention resource allocation situation awareness model, a new quantitative model of situation awareness was put forward, which considers the multi-resource load and information recognition theory. In this model, the multi-resource load was applied to the low-level attention perception. The individual's situational awareness was composed of the damping of initial cognitive resource and the inherent deep-level rule availability matching after the activation of situation. In order to verify the usability of the model, 15 subjects were selected to complete the simulated flight task in different situations, and the subjective 10-dimensional situational awareness rating technology (10-D SART) and objective flight performance, situational awareness global assessment technique (SAGAT), and physiological measurement (electrocardiogram, electrodermal activity and respiration) were combined to carry out the experimental test. The experimental analysis indicates that the trend of the theoretical value predicted by the model is significantly related to the experimental results. The proposed situation awareness quantitative model can give some reference to guide the design of man-machine interface in the cockpit and to optimize the flight task assignment. ENDSLEY M R. Toward a theory of situation awareness in dynamic systems[J]. Human Factors the Journal of the Human Factors & Ergonomics Society, 1995, 37	(1): 32–64. SALMON P M. Distributed situation awareness: Advances in theory, measurement and application to team work[D]. London: Brunel University, 2008: 19-20. ENDSLEY M R, GARLAND D J. Situation awareness analysis and measurement[M]. Boca Raton: CRC Press, 2000: 3-32. 刘双. 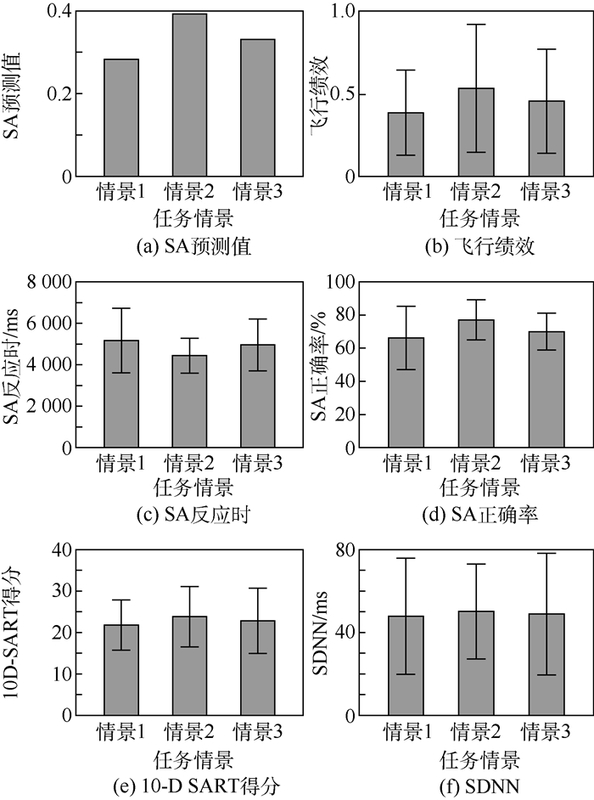 飞行员情境意识建模及工效评价研究[D]. 北京: 北京航空航天大学, 2015: 10-17. LIU S. Modeling pilot situational awareness and evaluation of ergonomics[D]. Beijing: Beihang University, 2015: 10-17(in Chinese). MCCARLEY J S, WICKENS C D, GOH J, et al. A computational model of attention/situation awareness[C]//Proceedings of the Human Factors and Ergonomics Society Annual Meeting. Los Angeles: SAGE Publications, 2002, 46(17): 1669-1673. WICKENS C D, MCCARLEY J S, ALEXANDER A L, et al. Attention-situation awareness (A-SA) model of pilot error: ARL-01-13/NASA-01-6[R]. Washington, D. C. : NASA, 2001. HOOEY B L, GORE B F, WICKENS C D, et al. Modeling pilot situation awareness[M]//CACCIABUE P C, HJA·LMDAHL M, LVDTKE A, et al. Human modelling in assisted transportation. Berlin: Springer, 2011: 207-213. 刘双, 完颜笑如, 庄达民, 等. 基于注意资源分配的情境意识模型[J]. 北京航空航天大学学报, 2014, 40	(8): 1066–1072. 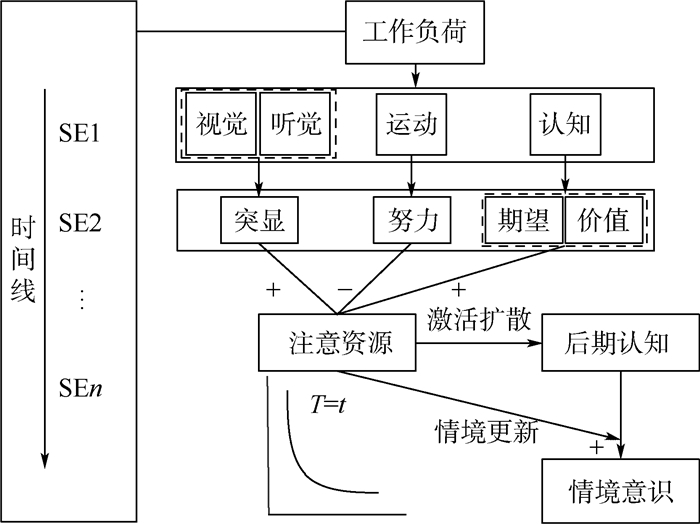 LIU S, WANYAN X R, ZHUANG D M. Modeling the situation awareness by the analysis of cognitive process[J]. Bio-medical Materials and Engineering, 2014, 24	(6): 2311–2318. 薛书骐, 张宜静, 王萌, 等. 基于"认知预期"的情境意识预测模型[J]. 航天医学与医学工程, 2015, 28	(2): 102–108. VIDULICH M A, TSANG P S. Mental workload and situation awareness[M]//SALVENDY G. Handbook of human factors and ergonomics. 4th ed. Hoboken: John Wiley & Sons, Inc., 2012: 243-273. GALOTTI K M. 认知心理学: 认知科学与你的生活[M]. 吴国宏, 译. 北京: 机械工业出版社, 2016: 42-43. GALOTTI K M. Cognitive psychology in and out of the laboratory[M]. WU G H, translated. Beijing: China Machine Press, 2016: 42-43(in Chinese). 完颜笑如, 庄达民. 飞行员脑力负荷测量与应用[M]. 北京: 科学出版社, 2014: 43-44. WICKENS C D, HOLLANDS J G, SIMON B, et al. 工程心理学与人的作业[M]. 张侃, 孙向红, 译. 北京: 机械工业出版社, 2014: 126-127. WICKENS C D, JUSTIN G H, SIMON B, et al. Engineering psychology & human performance[M]. ZHANG K, SUN X H, translated. Beijing: China Machine Press, 2014: 126-127(in Chinese). WICKENS C D. Display formatting and situation awareness model (DFSAM): An approach to aviation display design: AHFD-05-14/NASA-05-5[R]. Washington, D. C. : NASA, 2005: 1-15. 肖旭, 完颜笑如, 庄达民. 显示界面多维视觉编码综合评价模型[J]. 北京航空航天大学学报, 2015, 41	(6): 1012–1018. 吴旭, 完颜笑如, 庄达民. 多因素条件下注意力分配建模[J]. 北京航空航天大学学报, 2013, 39	(8): 1086–1090. WANYAN X R, ZHUANG D M, WEI H Y, et al. Study on pilot attention allocation model based on fuzzy theory[J]. Computers & Mathematics with Applications, 2011, 62	(7): 2727–2735. COLLINS A M, LOFTUS E F. A spreading-activation theory of semantic processing[J]. Readings in Cognitive Science, 1988, 82	(6): 126–136. FAA. Airworthiness standards: Transport category airplanes: CFR Part25[S]. Washington, D. C. : FAA, 2013: 194-195. 周颖伟, 庄达民, 吴旭, 等. 显示界面字符编码工效设计与分析[J]. 北京航空航天大学学报, 2013, 39	(6): 761–765. 白杰, 冯传宴, 杨坤. 飞行员脑力负荷生理测量方法研究进展[J]. 航天医学与医学工程, 2016, 29	(2): 150–156.